今年是狗年, 是象徵忠實, 誠懇, 貼心付出的一年, 先祝福大家有個旺旺福慧年! 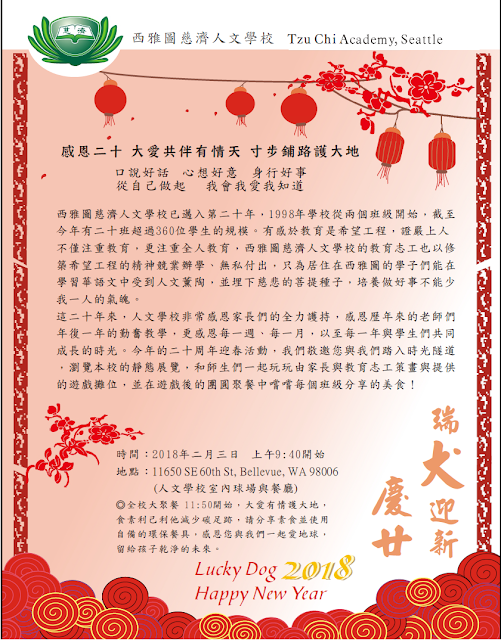 Our most exciting annual school event loved and favorited by the students is approaching - The Chinese New Year celebration event that will be held on February 3rd followed by THE all-school potluck. You and your family are cordially invited to celebrate 2018 Year of Dog with your children and the rest of the school community. Please see the attachment for the event flyer. In addition to the annual lion dance performance there will also be classroom performances, and school carnivals. What made this year special is that it coincides with the 20th anniversary of our school establishment, which is a huge milestone for our academy! We will be displaying static exhibitions about the history, establishment, and milestones of our school. It has been two years since we last held a school-wide potluck. For a potluck at this scale, it involves massive and strenuous task and planning, so we truly need your help and support to make it the most enjoyable experience possible for our students. This is a time to share food, laughter, and love. Having a meal together as a whole big family is an important tradition in Chinese culture. We hope that our kids can have the opportunity to be exposed to this authentic culture full of beauty and warmth through personal experience. For this was our main motivator to bring back the potluck once again after two years. Let’s all get together and enjoy such rare opportunity to bond with our children and the rest of the school community. In order for us to accomplish this goal, your support is highly needed and plays the most vital role of the event preparation. Please reply to your class coordinator or teacher about what dish(s) you would like to bring. Please first leave the food in the classroom in the morning and transfer the food to gym at 11:40. You are invited to join all school in the gym to enjoy the performance and game booth from 9:40 to 11:40. For years, we have been working diligently to demonstrate how to tender our Mother Earth. Our other goal set forth for this event is to minimize garbage/waste and maximize “reduce, reuse, recycle.” Please share a vegetarian-only dish, use non-disposable utensils/plates/bowls, and do not waste food. After all, parents are the role models and reflection of their children. They are constantly watching us and counting on us. 2018 is The Year of Dog, in which resembles loyalty, honesty, sincerity and unconditional love. We wish you all a prosperous year to harvest and enjoy. 新年活動一向是學校每年的大活動之一, 今年正逢建校二十周年, 除了歡樂的舞獅及班級表演, 還有年節園遊會之外, 停辦兩年的全校團圓大聚餐也將再次登場. 今年的迎春活動是二月三日, 園遊會後的聚餐請大家準備素食餐飲, 自備環保碗筷, 環保並且惜福, 響應廚餘回收, 讓我們活動雖大, 垃圾不大, 人畜平安, 地球沒負擔. Happy New Year! I hope that you all celebrated wonderful holidays with family and friends and found some time to relax and take a deep breath. During Winter break, admin team worked to test online report card project and upcoming event planning. Please mark your calendar for the following events and you will see how January is fully loaded. We look forward to seeing you at school and enjoying these special events with your students. 1/13 Principal’s coffee & New Year event planning meeting 2, 9:40 am at cafeteria; the first meeting Powerpoint can be found here.